When I tried the game on a slower PC, the framerate crawls down to 20FPS in that room. So, I think I´ll have to divide it into 3 smaller rooms to make it faster. After all, if you´ll spend a lot of time climbing the tower, it better be fast. Awesome its good to hear that the project is getting closer to completion. maybe this new area could be a secret weapons testing area with a lot of mechanical guys? who knows.. what ever you decide I cant wait to play this! my friends and i are still cheering you on from the usa!! How clever, I'm glad you were able to find a great spot for a secret area. I hope you make it so that it looks like the game can be completed without visiting it, so people can discover it on their second playthrough. As for what to put in the rooms, I'm not too sure. Here's an idea though, try making the "environment" of it distinctly different than the rest of the game. Examples would be, ice, mecha, jungle ruins, water, etc. I'll think of better ideas later on. I have high hopes for you. What may be beneath the tower? First of all, the passage leading to secret chamber is well hidden. It leads you through dark and claustrophobic tunnel. You can see there some strange object reminding you of metroid eggs... but all of them are broken and empty. Going deeper and deeper you finally riches a great gate with drawings representing Chozo warriors... but... wait... there's something moving towards you! !!! It looks like mechanical insect and it don't look friendly! Any way... I hope the real thing will be really exciting! Btw... sorry for my english... not native speaker. btw, do you plan to make multiple endings with relative artworks? Make up a new weapon or something perhaps? Screw Attack? Additional Metroids? A kitty? Perhaps the underground facility could be some sort of plant for harvesting energy? MR388 is full of lava, generates heat that can be used for geo-thermal power. Perhaps some advanced chozo form of this could be there? An abandoned energy experiment? Maybe even a way to utilize the energy of the Metroids themselves? That's about all I can think of for this tower's purpose. "The Chozo...must have had a GOOD reason for this." Dude, you totally have the wrong mindset for the chozo. if the tower is so important, why not booby-trap the bottom area ;) I am sure the chozo would do something like that. I translated the FAQ to german, why not post that? "The Chozo are one of the most mystical and advanced civilizations of the universe, and they decide to make a tower in the deep underground of a dangerous planet... they must have a GOOD reason to be so unpractical." I have an Idea. 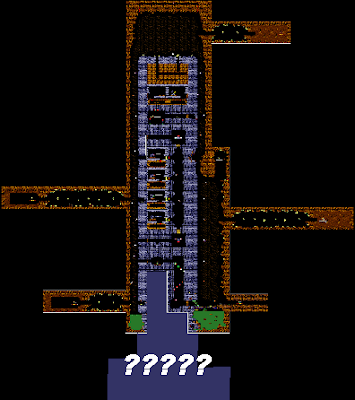 Maybe you get the power bombs here and the way to get to the lower section of the tower is to power bomb the left side wall in the first room at the base of the tower. And in the lower part of the tower is a remodled version of the ice beam called "The Ice Buster" (I know, the ice buster is from metroid prime) that is able to freeze metroids and slow down the Alpha to Zeta evolution stages and can beat the Omega stage of a metroid and a Queen metroid! Charge the Ice beam and switch to your missle launcher. Let go of the fire button to release a missle charged with the ice beam's power." Building off what Metroid fan said (some of it sounded a bit much, not to be mean >.>) but its an interesting idea to build off of. like if the lower areas were full of magma or some kind of bad air. It would be a good spot to stash the gravity suit i think. transitioning you into the 5th area. Also off of an_artist... i think it would be it interesting if the gravity suit was optional. As you did not have it in the original game. What ever u do Doc I'm sure you'll do great and i cant wait to play. Hey! i just remembered, i don't ever recall the gravity suit being in metroid 2. mabey i didn't get it? idk, if it isn't in it you should make it so that you get it in that secret place by defeating a new boss or somekind of Torizo in an never before seen chozo ruins! I'm so excited! keep up the good work! 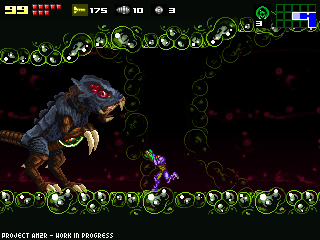 The additional rooms below the tower do sound like a great idea, but I think it should reflect on hoe the chozo created the metroids to fight off the x parasites. This looks great and I'm happy to hear you have gotten further! I was playing Super Metroid and I went into a secret area where it is dark and you have a small circle of light around you. Maybe you could do something like that? And you could either have a new weapon or just some expansions? I was wondering if you were going to be like the original and put all four beams in this same area... Because I think that would be kind of lame... I'm assuming not but it looks from the map you provided us (I have good eyes) that your keeping the 4 chozo statue rooms (originally for the 4 beams). I think it would be best to make one of the rooms contain the Plasma Beam, one with the Gravity suit, one with any type of expansion (super missile/ Power bomb /etc. ), and one with an energy tank or something. I just hope it doesn't contain all 4 beams. I'm glad to see the project is getting much closer to its completion! I've been watching from the very first week and am dying to play this beautiful looking remake! I was also wondering if you were going to make the missile expansions contain 10 like in the original or 5 like the other games in the series? I think 5 would be more fun (more exploration). Good luck on this project and I'm very grateful for how detected you have been to this project! It will see its completion, I know it! who said all 4 of those statues had to have something cool?? I think ice misses would be a nice add-on, something you can play the game with, but it would be a nice extra. Maybe some of the early evolutions could be weaker to it but not the later ones. Sort of a nice bonus for finding it that helps with the next bit of the game without making the end super easy. i am for rooms that show off more story. read the manga, incorporae something of it into the game. It should be a mini water area! Samus finds a secret passage... Whats this? Its full of water? Samus runs back out, the Metroid is goneand something is there.... Another Zeta! Samus kills it and once she finally does she is almost safe... Then as she goes to the secret passage the hatchling re-appears. But thankfully it morphs into a alpha, it's moving kinda sluggish... The killing shot bursts open its stomach and!!! Samus uses these to open up the secret passage but another way is opened... Theres the cocoon the Zeta was in then theres the chozo statue that WAS holding the power bombs that you now pozess. You power bomb it and you go up through the top and you get out of that hellhole, with 2 new abilities... :) Just a suggestion. Keep going! If you can't find a idea, just continue with the rest of the game. or... if you already have plans for a gravity suit... and extra 2 or 3 metroids and PHAZON SUIT!!! Immunity to completley crazy tentacles that are ALL OVER the queens layer and the very final places! Phazon suit FTW I beg of you to try that!!! I like the idea of Ice Missiles. I could really see the Chozo doing that. They of all people would know a Metroid's weakness. Another idea. How about bored Metroids? Like if the flight continues for too long they fly away. Then you go back into the room with the Metroid, and have to fight it again. That would increase game length, and it would not be hard. En fín ahí te dejo algunas ideas Doc, el nombre de la parte que haya que recoger será la sorpresa que nos harás ver en cuanto lo juguemos. Sigue tomandote tu tiempo para hacer el juego y a la vez disfruta haciendolo para que al jugarlos nos sintamos que estamos jugando a un metroid como los de toda la vida. I agree with an earlier post mentioning the use of the room to expand the story element. I really hope you're really familiar with the whole story of Samus' life, such as the timeline and the mangas. I just want the room to include something that brings back a memory from a game earlier in the timeline, or something that forshadows the next 3 games in the timeline (sm, mom, mf). I also hope for an appearance in X parasites, since this is the planet that they live in, and Samus killed a lot of metroids so the X could start appearing in the end. It got me worried when you mentioned that you didnt play the prime games yet, so I'm not sure of what other metroid games you haven't played. I hope that you've played (and memorised) them all before the game is finished, as well as read every manga. Forget the new one,Ive recieved news that the first two prime games and the third one are going to be re-released on just one single disc and the first and second games are going to be revamped to be used with a wii remote.How cool is that! I almost forgot that the X Parasites was on SR388. Doc don't forget that either. We need to see an appearance of the X Parasites somewhere in this game. Sweet man, I've been looking forward to this, keep up the good work! Daniel, (same name as me lol) we've heard about Metroid Trilogy since like, a months ago. You're a little late man. But we're all excited, its coming on August 24. YOU BETTER BUY IT DOC! c'mon, its all 3 primes + wiimote, and its the same price as any single game! if Nintendo hasn't seen this already and has decided to let this happen we shouldn't tempt fate for a possible "quality control". new area and new stuff cool... as far as "new" story some game makers can get a bit touchy in that area... i wouldn't suggest it. try to stay within the "remake boundary"
Im just wondering why everybody is making SO much big of a hassle over a little extra feature. Like, WOW. Maybe if every1 looked up on the story line a little bit that would help... Kraid or Ridley in SR388? No. Arachnus was in metroid 2 and fusion because it was just Infected... Get what Im saying at? Take some bosses from metroid fusion and add them to This remake down here if you really want to! I'd make ALOT of sense - "Oh look there's Serris from Metroid Fusion! ", If it was a water area or something! I think doc also said he does not want to include the X at all, but I'm still hoping for atleast a minor mention of them somewhere. I also enjoyed it because it was like a Weapons Testing Area, with all the beams lined up like that. The underground area could be a continuation of that, a secret weapons testing lab where you get powerbombs or something. Something that deserves to be isolated from the planet's surface. the complete metroid manga. 16 chapters, in english, if you never came around tor ead it, do so now. written by sakamoto, the man behind metroid. ties to metroid other m and shows the creation of the metroids and stuff. good read. as siad, im for story options. i rememebr that movie by alaxandre aja, mirrors. just by lookign at the place keif worked in you knew what was going on there. impressive scenerey. You know, something that's always bothered me about most of the Metroid games: You never see any boiler room/power generator type stuff. Perhaps you could make that area some mass energy generation system that would have supplied all Chozo structures on the planet. 3) For the Metroids being devoured natural X, so they will not be on display and will not be eaten to hide. These are some reasons to show why the X can not appear in this game. Doc, I hope this game eagerly. Less story and more exploration gaming. There's plenty of outlandish ideas going on here. C'mon, stop trying to fit Metroid Prime and "Who were the Chozo" in this game. Metroid is not about characters. good point about Samus' quote on having never seen the X before. I forgot that. Yet, I still believe the X could appear in a cut scene or inside a cavern that samus is walking over. Why i think it matters is beacuse the manga has a large mention of the X in chapter 4 (page 10-14), and the manga has nothing to do with metroid fusion. I know you have a long way to go before you get to this point but you should extend the ending. For example, when I played Zero Mission for the 1st time I expected the game to end where the Original did. But what I thought was the ending was only the Beginning. How many areas are in this game? I like your ideas and wish more luck on your project. We all at MFM are cheering at you. will there be controller support. will i be able to plug in my xbox360 controller and use it. I know some of the buttons work but I can't use the d-pad and that is the main reason for wanting to use the controller. I think you're awesome for doing this project, but is there any chance you've seen other complaints about regular freeze-framing during gameplay? I play, on a C2D E6600 with 2GB of RAM, and every few seconds the game will freeze frame and then continue. I've defragmented every drive, shut down all background programs, messed with the game's vsync and stretch options, but nothing helps. No other game does this, just your game. I whined about it early on, but I don't think anything came of it. Have you heard of others having this problem? Is there any chance for a fix? Anyway, thanks, and keep up the good work. Have you tried deleting the game and re-downloading it? I have had this problem before with other games and it solved the problem for me. Yep...I've redownloaded. Nothing works. It seems to just be with this game. Maybe it's something with the engine that he's using, but I wish it would get fixed. To DoctorM64: Are there forums where we can post these types of problems? Even if someone else is experiencing it, right now there's not really any way to tell. Most people aren't going to see these comments. Is there actually a place to download the game so far, or are you only releasing the technical demo at this time?